The Pre-Budget Statement showed us just how enormous Mr Brown's credit card bill now is. Yet we taxpayers are meant to believe that we shouldn't worry too much because the pain can be pushed off into the far distant yonder. Needless to say, that' wildly misleading, as we can see by considering our prospective annual debt servicing burden. First, there's the interest on our official government debt. According to November's Pre-Budget Report (PBR), that will increase from £30.8bn in 2008-09, up to £40bn in 2010-11. Assuming the same average interest rate applies thereafter, the PBR debt projection implies interest payments increase to £51.5bn pa by 2013-14. 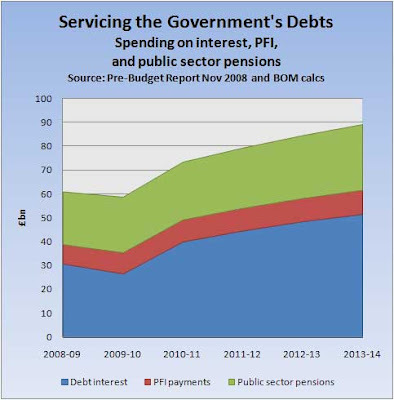 Second, there are the contractural payments under PFI - debt servicing in all but name. According to the PBR, they will increase from £8.2bn this year, to £10.2bn in 2013-14. And third, there are the payments of those unfunded public service pensions - a huge undeclared debt which is generating a rapidly escalating annual bill. The PBR shows these pension payments increase from £22bn this year, to £24.1bn in 2010-11, and we estimate he's building in a further increase to £27bn - £28bn pa by 2013-14. So adding these three debt servicing streams together, we are looking at a cost increase from around £60bn this year to around £90bn in 2013-14 - a whopping 50% jump in just five years. And just to put that in perspective, to pay for an extra £30bn pa of debt servicing will require an increase of 6p in the standard rate of income tax. But even worse than that, these numbers are based on Brown/Darling's highly optimistic PBR assumptions on economic growth. And they take no account of the debt issued to pay for bank bailouts. Factoring in more realistic assumptions cranks up the debt servicing numbers even more. We estimate that by 2013-14 merely servicing the government's debt will be costing us well over £100bn pa. Or more than £4,000 pa for every single household in the country. And do you know the very worst bit? The debt itself will still be growing. There is as yet no credible plan for reducing - or even stabilising - it.